How to Copy Motorola Text Messages to iPhone? Home > Resources > Transfer > How to Copy Motorola Text Messages to iPhone? Planning to purchase a new iPhone 8 and give away your old Motorola Moto X, but you just don't want to leave your private text messages behind the Motorola phone and want to transfer them to your new iPhone 8. However, Android data can't be extracted from Android to iPhone because of the different operating system. What can we do? Now, here is an awesome transferring tool for you to transfer your Motorola text messages to iPhone – Mobile Transfer. 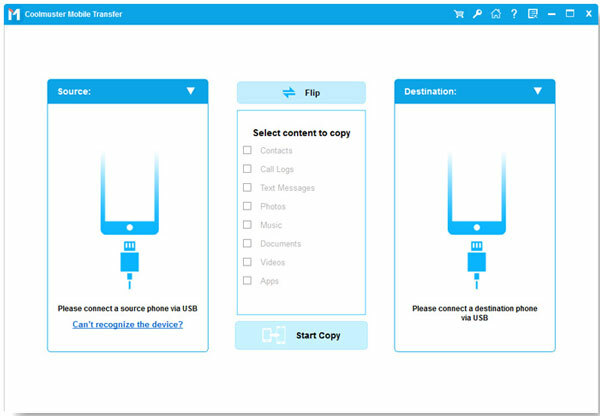 Coolmuster Mobile Transfer is a useful phone to phone data transferring tool for those who want to transfer data between what devices, including Motorola Droid/Atrix/Moto X and iPhone 8/7/7 Plus/6/6S/5/5S. 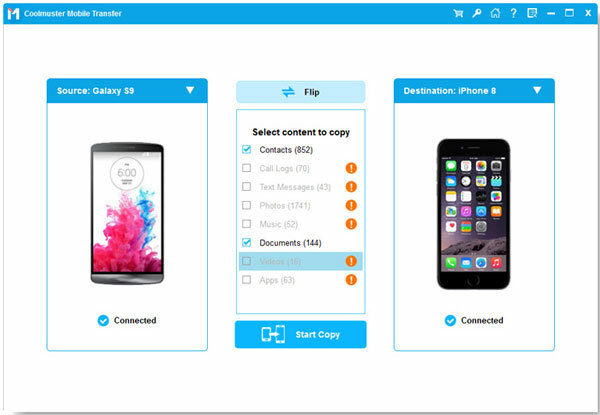 You can copy your precious data, such as text messages, contacts, photos, videos, music, apps and more from one phone to another without doubt. Now, you are allowed to move your text messages from Motorola phone to iPhone as long as you follow the tutorial below. Download Mobile Transfer on your computer and let's start copying Motorola text messages to iPhone. To begin with, download and install this Mobile Transfer on your computer. Launch it and connect your Motorola phone and iPhone to the computer via USB cables so that they can be detected by the program. Choose the first option called "Phone to Phone Transfer" from the main interface and click "Start" to enter the phone transferring window. The two phones and all transferable file types are displayed here. Choose "Messages" category and all text messages will be scanned out and displayed. You can select the messages you want to transfer from Motorola to iPhone and click the transferring icon that points to iPhone to begin the transfer process.